To a large extent man is master of his environment and the likelihood of being attacked, let alone eaten, by a wild animal is pretty slim. This is certainly true of the developed world, and no more so than the U.S. Yet there are still a few creatures that rule their domain, even in America, and these are more than capable of making a meal out of the average human. Strangely enough it seems that a fair few of these big carnivores are found in the number one retirement state. 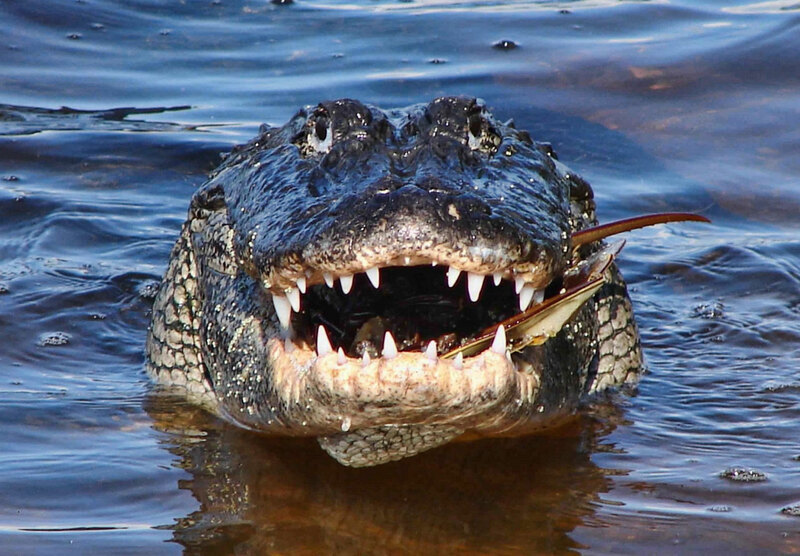 Florida has them all; black bears, cougars, tiger & bull sharks, crocodiles and alligators. Given the proximity of large numbers of people to these animals it just goes to show that on the whole they really just aren’t that interested in eating us. There are reckoned to be over a million alligators in Florida alone. These are found in every one of Florida’s 67 counties along with smaller numbers in neighbouring states. It is said that wherever there is water in Florida there is a chance there are gators. 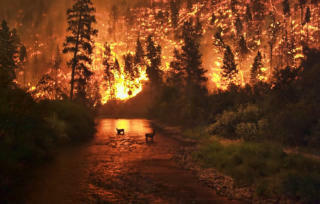 This could be lakes, rivers, marshes or swamps. Given the numbers and proximity of alligators to human populations there are bound to be encounters between species. Generally speaking alligators are afraid of humans having been hunted for centuries up to the point they were almost wiped out. Also, humans are not really on the menu. Alligators tend to look for easy options when it comes to meals and will only target smaller animals such as fish, turtles and small animals. However, alligators are opportunists, and not being the brightest of animals tend to think with their teeth. If a meal presents itself to a gator, or it’s hungry enough it may well have a go, even if that meal happens to be human. Of all 23 species of crocodiles and alligators only 8 have been known to attack humans without provocation. Unsurprisingly the two biggest killers are the saltwater crocodile and the Nile crocodile, but also on the list is the American alligator. 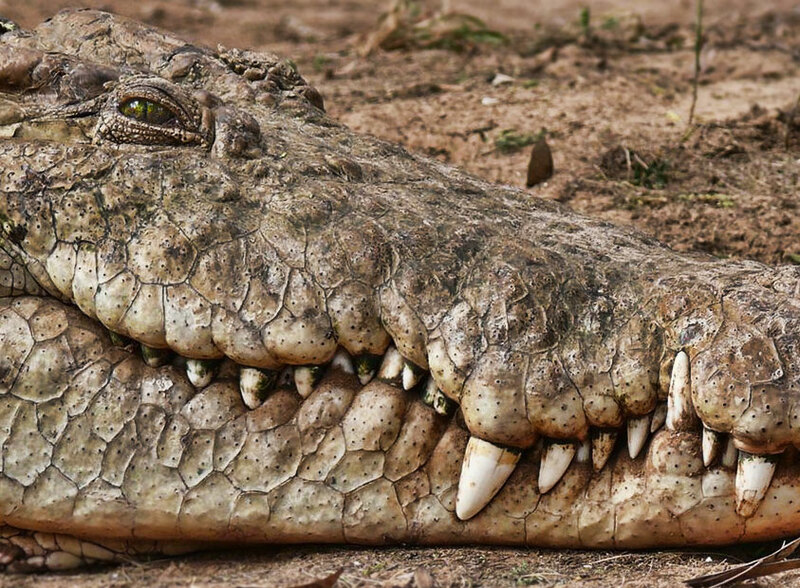 While the former reptiles kill hundreds of people every year (around 1,000 between them) the death toll from alligators is only around one person every year. There are several reasons why an alligator might attack a human. Firstly, alligators will defend their nest if they think their young are in danger. Then there is the possibility of mistaken identity and also the possibility that they might just regard a human as a meal. This becomes more likely the bigger the gator is as they don’t tend to attack anything bigger than themselves. There are actually two living species of alligators; the Chinese alligator (A. sinensis) and the American alligator (A. mississippiensis). You can probably figure out where they are found from the names! The American alligator is significantly bigger than the Chinese, up to 10 times in many cases. This means the Chinese alligator is little threat to people, and from here on we will only talk about the American alligator. The name alligator is believed to have come from the early Spanish explorers of America who named these enormous reptiles “el legarto” meaning “big lizard“. American alligators are found in the southeastern states – predominantly Florida and Louisiana but also in Georgia, Alabama, Mississippi, the Carolinas and certain parts of Texas, Arkansas and Oklahoma. Within their range alligators will live practically anywhere there is water, except the sea. This includes ponds, lakes, swamps, wetlands, marshes and rivers. 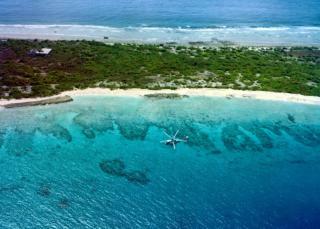 They will also live in the brackish water found in estuaries and mangroves. Adult alligators are apex predators in their environment. Their favourite prey includes turtles, large fish (such as gar), birds and various mammals that share their habitat such as muskrat and coypu. Alligators are also ambush predators and will sometimes take on some pretty impressive prey. Not only have dogs been taken this way but black bears and Florida panthers too. However, it is the case that this predation may go both ways. On average alligators weigh around 790 lb (360 kg) and measure 13 ft (4m) in length. Larger specimens can be over 1,000 lb (450 kg) and 14 ft (4.4 m) long. The biggest ever recorded gator was caught off Marsh Island in Louisiana in the 1890s and measured an enormous 19 ft 2 ins (5.85 m). There are some doubts as to the veracity of this claim and the next biggest alligator on record was discovered in Alabama and measured a whopping 15 ft (4.6 m) in length. How fast can an alligator run? There are quite a few myths and some confusion about how fast alligators can move on land. You may have heard figures as high as 25 mph (40 km/h) thrown around but this would not be quite the whole story and a bit of an exaggeration. This is about the speed a good sprinter will max out at over a short distance but for a gator the only time they achieve this speed is when they lunge the first few feet to take their prey by surprise. After this it is unlikely the alligator would manage to reach anything over 10 mph (15 km/h). Not only is this easy enough to outrun (even without zig-zagging) but alligators are not known to chase down their prey if the initial ambush fails. Although it is difficult to work out the age of an alligator studies have shown that they live, on average, for between 30 and 50 years in the wild. In captivity alligators have been known to live over 80 years as is the case of “Muja” in Belgrade Zoo, Serbia, which has been there since 1937. Can an alligator kill a human? Well, I think we have already answered that question. Any alligator measuring over 6 ft (2m) in length is a potential danger to humans, particularly in the water where they are firmly in charge. With an average size of 8.2 ft (2.6 m) for females and 11.2 ft (3.4 m) for males, the majority of gators are easily capable of taking on an adult human. As apex predators alligators have a formidable array of weaponry – both offensive and defensive. 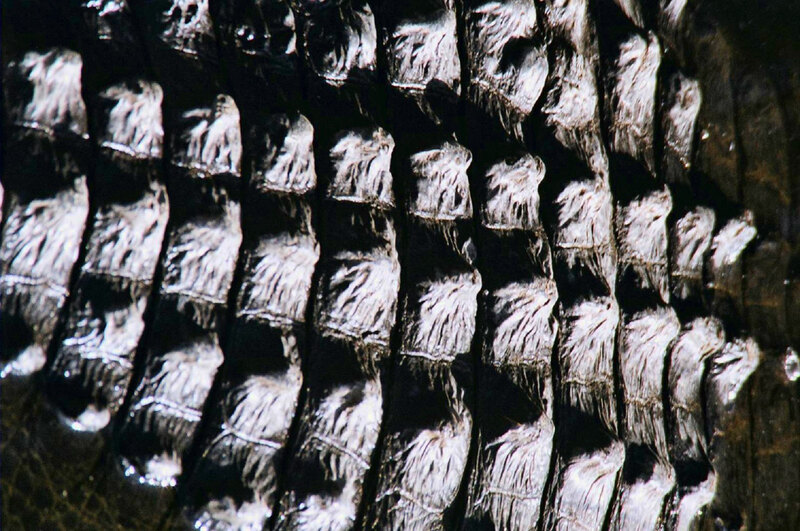 The alligator’s primary killing equipment are its jaws. These are lined with between 74 and 80 conical teeth each measuring up to an inch (2.5 cm) in length. The purpose of these teeth is to grip the prey and prevent it escaping. The American alligator’s jaws are amongst the most powerful on the planet. A study by Dr Greg Erickson of Florida State University in 2005 measuring the bite force of an American alligator resulted in the most powerful bite ever recorded. The 13ft (4 m) wild gator gave a bite power measurement of nearly 3,000 psi – that’s 3 times the strength of a bone-crushing hyena bite. Whilst the record was surpassed by a 17 ft (5.5 m) saltwater croc in 2012 with a reading of 3,700 psi this is still an awesomely powerful bite. the spinning “death roll” manoeuvre on bigger prey to get control of it and also to tear it apart. Alligators and crocodiles do not have cutting teeth and must therefore rip apart any prey that is too big to swallow whole. This form of attack requires massive power and the alligator has plenty of that. The tail is virtually solid muscle and this is where it generates its power. 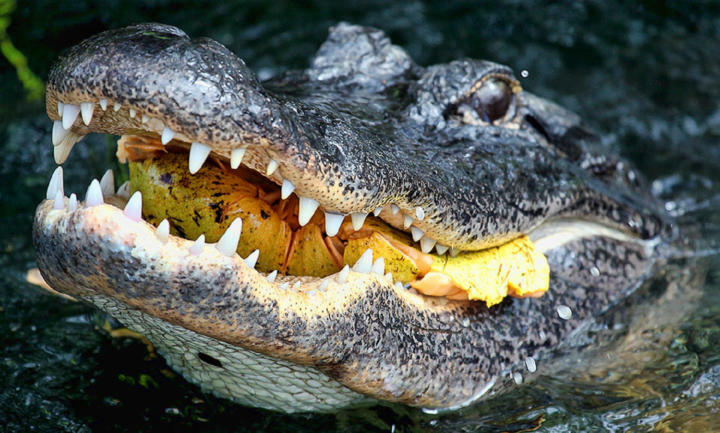 The alligator’s hunting methods may also bring them into contact with humans. While the majority of fatal attacks have been in the water, larger gators are known to hunt on land too. Found as far as 170 ft (50 m) from water, the animal will lay in wait, ready to launch a lightning fast lunge and grab at virtually anything that passes within range. This type of hunting usually takes place at night so mistaken identity is a real possibility. So, the alligator is a finely honed killing machine. However, it wouldn’t have stuck around for 180 million years if it wasn’t pretty good at defending itself too. Like others in the croc family gators are armor-plated making it pretty hard to stop one with anything short of a hunting rifle. The skin itself is super tough but the real armor is on the back where the skin contains bony plates known as osteoderms. How to survive an alligator attack? Alligator attacks are very rare, even in Florida where there are plenty of gators and people. Perhaps the best way to survive is to avoid attack in the first place. Take special care in places that are known to be home to these reptiles; this means definitely don’t swim and also avoid the water’s edge – alligators are ambush hunters and can lurk, unseen, just waiting for something or someone to come along. Time of day is also a factor in alligator attacks with dawn and dusk being prime times to avoid. If in the unlikely event you do get attacked you need to make life as difficult as possible for the gator. They’re after an easy meal so anything to prevent this will go in your favor. Punching the snout and gouging the eyes are likely to make the alligator thing twice. It may also make the gator adjust its grip at which point you may have an opportunity to make your escape. On the plus side the odds are firmly on your side as the vast majority of alligator attacks do not result in serious injury and very few indeed are fatal. Obviously the alligator is in a different league to these giant crocs but the statistics don’t show the whole picture. Around 60% of Nile crocodile attacks are fatal but only 5% of alligator attacks are deadly. Ten years ago there were an average of around 11 alligator attacks in Florida each year but this number has been slowly creeping upwards. In fact over recent years there has been an average of one fatality a year. One you’ll see in a while and the other you’ll see later! Ho ho! Bad joke out of the way, there are a few ways to tell these reptiles apart. The first is to ask yourself, “Am I in the southern states of the U.S.A. (or on the Yangtze river)?”. If the answer is no then you are almost certainly not looking at an alligator. Physically these two families of crocodilians are very difficult to tell apart from the neck down, i.e. most of the differences are on the head. 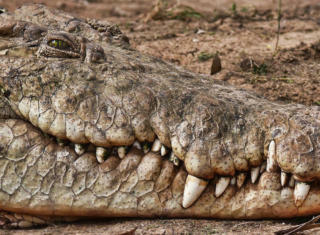 The classic way to tell is by looking at the teeth (from the side) when the mouth is closed; if you can see both upper and lower teeth protruding then it is probably a crocodile. 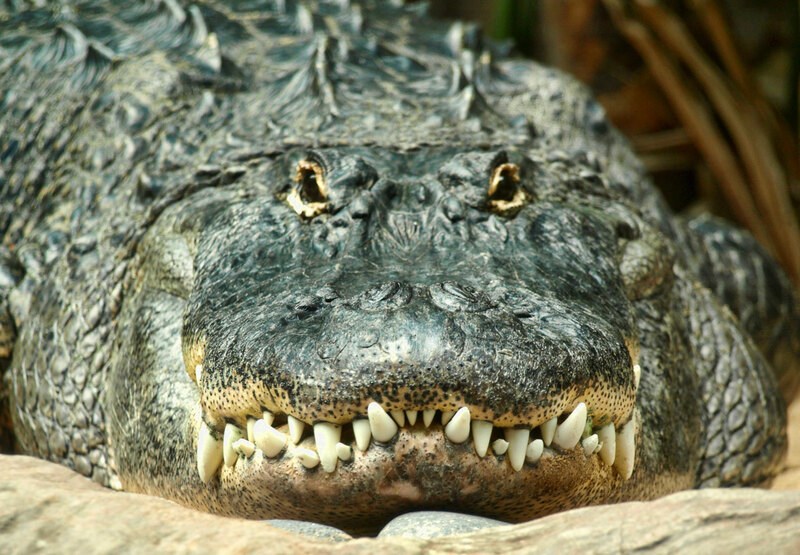 Alligators have wider upper jaws so this overlaps and covers the bottom teeth. The shape of the snout is also often a clue. The alligator has a broader U-shaped snout compared to the longer, thinner V-shaped snout of the croc. Interesting article. I learned some stuff. But I have a question. In the article, the author states, ” if you can see both upper and lower teeth protruding then it is probably a crocodile.” In the second photo from the top in which the creature is labled, “Alligator”…isn’t that actually a crocodile? I’m seeing uppers and lowers. I think the test is to look side-on at the croc/gator. Then if the lower teeth overlap it’s a croc. The gator in the photo is front-on. Not sure if this method is 100% accurate either.